Whichever politician wins the Socialist Party primary will go into the spring 2012 presidential election as favourite to be the next French head of state. That fact alone should mean a mood of eager confidence. In theory, the Socialists are poised to retake power from the right after a gap of 17 years. But something is not quite right, and the Socialists themselves feel it. Deep down they know that the struggle to unseat President Nicolas Sarkozy will be much harder than they thought. As nominations close on Wednesday for the October primary, all eyes are on two frontrunners: the current and former party leaders Martine Aubry and Francois Hollande. There are four other declared candidates: Segolene Royal, who lost against Mr Sarkozy in 2002; two leaders of the younger generation, Manuel Valls and Arnaud Montebourg; and the head of the Radical Left Party, Jean-Michel Baylet. In addition there is the great might-have-been across the Atlantic. Dominique Strauss-Kahn, disgraced then partially rehabilitated in the New York chambermaid scandal, cannot be ruled out as a last-minute entrant. There has even been talk of the Socialists extending the nomination deadline to give their one-time favourite, the former IMF chief, the chance to run. However, the odds of a DSK candidacy look slimmer by the minute. Leaving aside the practical question of his ongoing court case, Mr Strauss-Kahn has suffered badly in the eyes of French opinion. His political ambitions are most likely now on hold. This year for the first time the Socialists have chosen an American-style open primary, rather than a poll of party members, to choose their presidential candidate. After three months of campaigning, a first round of voting will be held on 9 October. Any French adult can take part who is willing to pay a nominal fee of one euro and sign a pledge that they support "the values of the left". If no candidate reaches 50% of the vote in round one, the top two qualify for a second round a week later. The Socialists hope that on 16 October a left-wing champion will thereby emerge with the legitimacy of having been chosen by perhaps three or four million primary voters, not just by the party faithful. No longer will the party face criticism for being inward-looking and dominated by factional interests. This way the candidate will have a genuine popular mandate to take on Mr Sarkozy in April. On the face of it there are plenty of reasons for the Socialists to be optimistic as the election season looms. Their great hope DSK may no longer be in the picture, but polls still show both Ms Aubry and Mr Hollande easily capable of beating Mr Sarkozy. According to a survey conducted by BVA for the French regional press this week, Ms Aubry would come first in round one of the election with 28% to Mr Sarkozy's 24%, and 17% to far-right leader Marine Le Pen. 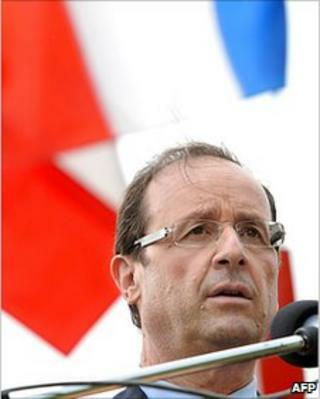 Mr Hollande would have 31%, against 23% for Mr Sarkozy and 16% to Ms Le Pen. Both Mr Hollande and Ms Aubry would then go on to clear victory in the second round head-to-head with Mr Sarkozy. The incumbent president is a divisive and unpopular figure. Though his poll-ratings have edged up from their rock-bottom levels in recent weeks, he has never captured the heart of the French people like his two predecessors, Jacques Chirac and Francois Mitterrand, managed to do. He is a hate-figure for the left; and on the right, many who believed he would let them "earn more by working harder" feel disappointed by failed economic promises. Others simply dislike his character. Given all that - and with the country's collective state of mind so fearful and uncertain - an effective left-wing opposition leader should surely be a shoo-in. So why is it that the prevailing sentiment among Socialists is not optimism, but doubt? As the left-wing newspaper Liberation put it in an editorial Monday: "Despite the continuing disaffection for Nicolas Sarkozy, a [Socialist] victory is far from preordained." There are several reasons. The first centres on the candidates themselves. Ms Aubry and Mr Hollande have plenty of qualities, but they have weak spots too. Mr Hollande, for example - despite a long political career - has never once been in government. As for Ms Aubry, her public persona can be severe and humourless. And even her friends admit she long doubted whether to run for the presidency. Many question whether she has the appetite for the job. A second problem is the party's manifesto, which Mr Sarkozy's UMP party can too easily portray as backward-looking and doctrinaire. One commitment is to reverse Mr Sarkozy's reform raising the age of retirement. Another is to create 300,000 state sector jobs for young people. Ideas like these are crowd-pleasers for the left, but the voting public is sceptical. The third problem is the endemic factionalism which the primaries are intended to resolve but in fact can only mask. The personal and political divisions inside the French Socialist Party are so deep-rooted that no-one is fooled by outward manifestations of unity and brotherly love. As long as DSK was the uncrowned "king across the water", this could be overlooked. What all Socialists agreed on was Mr Strauss-Kahn's vote-winning potential, so as they awaited his return they learned to contain their differences in the interest of ultimate victory. But now that Mr Strauss-Kahn is almost certainly out of the race, the lid is off. Ms Aubry may insist that she "has only one enemy and that is Nicolas Sarkozy." In the immediate term, everyone knows that her main adversary is Francois Hollande. So the big risk for the Socialists is that the primaries turn not into a consecration of unity, but the political equivalent of a bar-room scrap. If that happens, then the number of people bothering to turn out in October will collapse - and the whole legitimacy of the exercise will be even further undermined. The Socialist Party has not won a presidential election in France since 1988. Its only president since World War II has been Francois Mitterrand. If they want to show the world that they are still a relevant force in French politics, then they need desperately to win the presidentials next year. It should not be that hard. And yet somehow it is.